Many who have lived in a reasonably-populated area have experienced the "kook on a hill", with rumors and legends scuttling about how they arrived at their current state. It leads to scornful eyes and social shirking that follow whenever they turn up, often created by mean-spirited hearsay. Get Low, first-timer Aaron Schneider's melancholy little comedy-drama, guides us back to Tennessee in the '30s when these small-town yarns spanned counties instead of around the neighborhood, with a tattered old hermit named Felix (Robert Duvall) shooing folks off his country property with a shotgun and a smirk. Stories circulate about why he's holed up in his weathered cabin, with nobody but his donkey to keep him company; the film's tonal versatility comes in how the story uses this folklore -- and the old man's awareness of it -- as both a mouthpiece for humor and an easygoing, artfully-shot medium for soul-searching. See, Felix has started feeling the weight of his age. He figures it's close to time for him to "get low" as his health begins to deteriorate, and he uses the opportunity to look his isolation square in the eyes. With a fistful of sweaty cash, he goes into town -- a place where rumors of his violent, murderous nature circulate -- and starts to make arrangements for his passing. Only Felix wants a pre-death "party" instead of a funeral, where he's inviting everyone within earshot to tell whatever stories they've heard about him. Struggling funeral parlor owner Frank Quinn (Bill Murray) and his eager down-home assistant Buddy (Lucas Black) scramble to fulfill the arrangements, with Felix trying everything under the sun to get as many people in attendance as possible. But why does a hermit who's lived away from society for roughly 40 years really want to get everyone together for, in essence, a public flogging? Chris Provenzano and C. Gaby Mitchell wrote the script for Get Low with a real-life hermit from 1930s Tennessee as a template, and the well-aged scaffolding supporting the story is as sturdy as it is windswept. Felix harbors a secret that few, if any are aware of, obviously tying to his hermetic lifestyle. 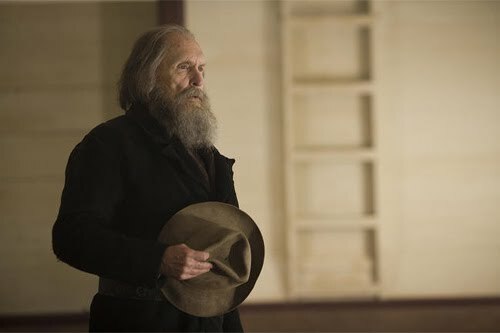 Even though the progression to its reveal creaks with familiarity, his stand-offish state becomes a convincing backbone to the rustic, tonally modest film, using both the humorous "how" and the meditative "why" behind his funeral party for a sharp blend of wit and authenticity. The key here comes in Schneider's awareness of the film's thresholds; he never bloats Felix's kooky old-timer curio or the macabre chuckles behind mortality and funerals, while rearing back from overt drama until the time's right. His direction renders a quiet and amusing glimpse into grief and reflection, shaping a welcoming environment for the old, bitter man to thaw his icy exterior. Felix Bush embodies nearly every stereotype befitting the cranky old woodland hermit, from the "No Damn Trespassers" sign staked at the front of his home to culinary prowess in using what's around his cabin. But Duvall brings a gripping vintage soul to the character that only he can, an air of complexity to Felix's serrated outlook that's at ease in the actor's skin (see The Road and Open Range for recent similarly-held versions). There's an introspective profundity to Felix that fits Duvall like a worn pair of overalls, containing both vulnerability and gnarled cynicism. When he interacts with Mattie (Sissy Spacek), a woman with whom he shares a history before his days of isolation, the two tell a story on their own that hints at the point when Felix shifted from a common man to one of ardent reclusion. Get Low has a knack for communicating the past through restrained implication instead of description, which lends solemn endearment to the slow reveal of Felix's Pandora's Box. Alongside, our attention refocuses on Frank Quinn's almost deadpan antics as he scrambles to clean Felix up for his party, print up posters that tout the ragged hermit's crazy notion for a funeral party, and convince his client that he's making the right choice with his fistful of post-mortem currency. Bill Murray perfectly fits the mold of a slippery funeral parlor owner, latching onto his signature subdued wit and nonverbal mannerisms to create Frank, unmatched by even Steve Zissou or Broken Flowers' Don Johnston in his smarmy appeal. His eureka moment when he realizes the lucrative potential behind Felix's soirée got a hearty laugh out of me, becoming the ignition point where the film's comedic temperament really begins communicating. Murray's pessimistic quirk becomes the stamina behind the film's humor, bouncing off of Duvall's oaken gloom for its punchier, memorable moments. While Schneider trots through Frank's snaky smooth-talking and Buddy's doe-eyed romanticism, the mannerisms Felix forces through his clenched teeth and wooly beard consistently hint at a man who's ready to unburden himself. And, to Get Low's success, we actually want him to; each moment we see the thin, misanthropic recluse fill a room in a manner unbefitting his small frame, our curiosity deepens with our developing compassion. Based on the opening, we've got a hint about what his secrets might entail, yet the build-up to his funeral party becomes a deeply-felt journey nevertheless. It's a film that slowly lures in our sincere interest, charming with its crowd-pleasing swirl of chuckles and contemplative tenderness, while the weight of Felix's rumor-negating reveal -- paired with a scene boasting every ounce of Duvall's acting prowess -- telegraphs a duly-earned emotional punch at the end.